Today’s sport business is far away from the status it once had. Professionalization and commercialisation are the terms that dominate many of nowadays sports leagues in different countries. Therefore it is hardly surprising that numerous teams passed the one billion dollar mark in terms of team value, like Manchester United ($2,23 billion), Real Madrid ($1,88 billion) or the New York Yankees ($1,85 billion). Clubs that participate in the world’s most famous competitions generate annual incomes that are easily comparable with medium and large-sized enterprises. One major source of revenue, for nearly all professional sports clubs, is the profitable commercialisation of their brand and their media presence through sponsorship agreements with different kinds of companies. On the other side there are commercial companies that seek, pressured through the increasing competition among many markets, for effective ways to communicate and build their brands. Those companies are often willing to pay high amounts of money in order to associate their products and brands with a sport club, athlete or sport event. Despite this obvious potential for sport clubs, many of the North American sport leagues have reservations towards particular forms of sport sponsorships. However, sponsorships are common tools in multiple areas like music, arts, culture in general and sports, whereby sport sponsorships are nowadays highest developed scope of sponsorships with an quota of between 50 and 70% of all sponsorships worldwide being associated with the sport business in 2005. But why is this form of sponsorships so famous? The reasons for the rising and distinctive interest in sport sponsorships are diverse. Circumstances like an increasing public interest in sports, leading to high media coverage, as well as the growing amount of brands that target sport-lifestyle consumers could be considered as major reasons. On the other hand many companies seek for more effective marketing measures compared to traditional and less effective advertisings. Generally there are three established patterns in shirt sponsorships. The logo-free approach is mainly used in the North American major leagues and implies that there are no logos from sponsors on the player’s shirts. The restrained approach comprises for instance most of the European football leagues and is characterised through strict limitations on quantity and size of logos. The last group is called the unrestrained approach and gives nearly no restrictions about the number of logos. This approach is mainly followed in European ice hockey. 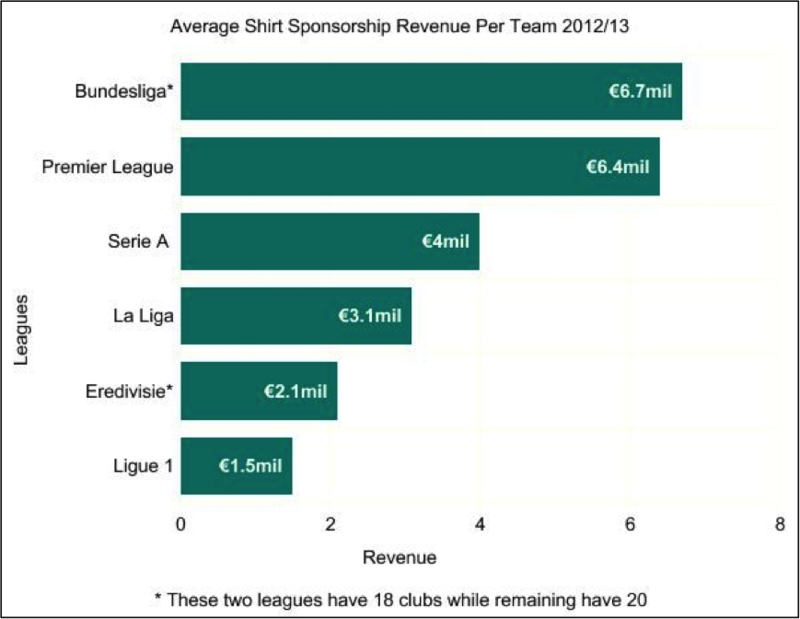 Shirt sponsorships are a common sponsorship tool in most European top leagues. That is mainly because companies pay high amounts of money for the rights to display their logos on the shirts of the clubs. Because these deals are a valuable source of revenue and shirt sponsorships are widely accepted among the European fan scene, in the three big football leagues, Bundesliga, Premier League and La Liga (Liga BBVA), mostly all participating teams have currently contracts with shirt sponsors, or are actively searching for them. The latest record-breaking commitment was announced between Manchester United and the car manufacturer Chevrolet at the beginning of 2014. Chevrolet will replace the current shirt sponsor Aon from the upcoming season for an amount of $79.85 million per annum. Based on facts like a high media coverage and a large public interest the NBA could be described as highly appealing and therefore as an suitable candidate for shirt sponsorship agreements. However, a comparison of the NBA with the European approach shows that the NBA seems to be much more restricted in terms of sponsor’s visibility. This is mainly due to the strong tradition of many sports in America as well as the fear of negative responses from the public. On the other hand there is the fact that teams are not invulnerable against financial issues like the Lockout situation of the NBA in 2011 demonstrated. This fact together with the financial interests of franchise owners and shareholders led to a first slightly rethinking of the NBA officials in terms of shirt sponsorships. Undoubtedly the decision for or against logos on players’ shirts is associated with pros and cons or in other words several risks and challenges. If and in how far the NBA is willing to take these risks in return for higher revenues, as well as the question whether supporters and fans would react in a negative way has not been proofed or decided yet. However that be, before making final decisions the NBA should conduct comprehensive researches on that issue. The attached paper was submitted to Coventry University in March 2014 as part of the assessment requirements. It gives an overview about the theory of sponsorships in general including objectives and risks and challenges for sponsors and sponsees and summarizes some useful statistics about the value of sport sponsorships in Europe. Furthermore the paper discusses the issue of shirt sponsorships in most North American major leagues using the example of the NBA and compares the North American with the European approach. Please feel free to download this work for future references.